After some search i found that there is some problem with my DNS server. And now when i am using GREAT BSNL as my internet service provider, this is a common problem with BSNL DNS servers that sometimes they don’t work for some time. Solution is you can change your DNS server. 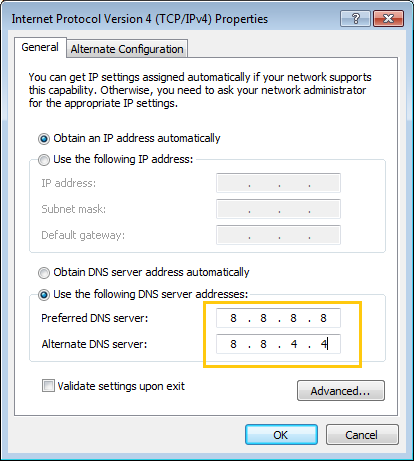 Here is how you can configure your network adapter to use a different DNS server. You can use either Google Public DNS or OpenDNS. I used Google Public DNS. Google Public DNS IP addresses are 8.8.8.8 and 8.8.4.4 and OpenDNS Public DNS IP addresses are 208.67.222.222 and 208.67.220.220. Open Network and Sharing Center. Open your Network Connection Properties. 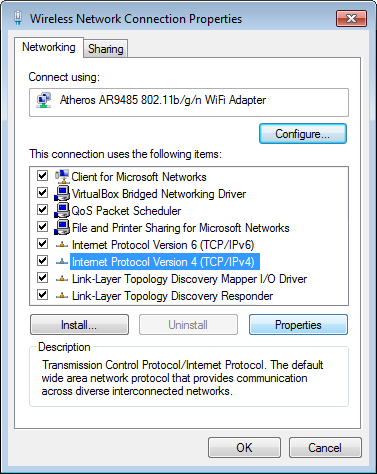 Select Internet Protocol Version 4 and click on properties. Fill the following value in DNS server addresses field. These values are for Google DNS server. If you want to use OpenDNS replace following fields with 208.67.222.222 and 208.67.220.220 respectivily. That’s very easy fix for this problem. Hope BSNL would take step to eliminate this problem in future.